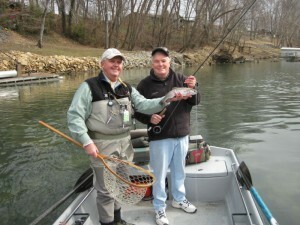 Last year we had seventeen clients catch their first trout on a fly with us. Chuck is our first client of 2014 to catch his first trout on a fly. This fly fishing trip was a Christmas gift to Chuck from his daughter and he picked some good weather on Monday for his first fly fishing trip. Chuck is quite an accomplished fisherman with spinning and bait casting equipment which sometimes makes the conversion to fly fishing a little confusing. However, Chuck is just one of those fishy guys and he was a really quick study and was actually hooked up in the first five minutes on the river. We caught a nice number of fat Rainbows on #16 Born’s Hairy Legged Sowbug and #16 PBS’s. It was almost like a spring day on the river and I think Chuck really enjoyed his first fly fishing experience. Hopefully he will bring his daughter with him on the next trip.